Sage Carrigan never meant to be the other woman. Unfortunately bronc rider Dawson O’Dell neglected to mention he was married the night he invited her to his bed after they’d both placed first in their rodeo events. When his wife walked in on them Sage was deeply hurt and humiliated. After an accident in the ring the next day, Sage decides she’s quitting the rodeo--and cowboys—to become a chocolatier in her hometown ranching community, Marietta, Montana. She’s doing just fine, but then Dawson shows up —five years later, with a little girl in tow. He’s here for the Copper Mountain Rodeo hoping to win big. But he’s also got plans of settling down with his daughter and buying a house—the very same one that Sage has been dreaming about. He says he’s here for her and he’s making lots of promises. But can he keep them? Rita Award nominated author C.J. 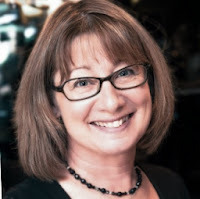 Carmichael has published more than 30 books with Harlequin. Right now she's loving cowboys and Montana--those are the themes of the books she's writing for Harlequin American. You'll find both on Amazon, kobo and her website. The books in the Copper Mountain Rodeo series are only getting better. 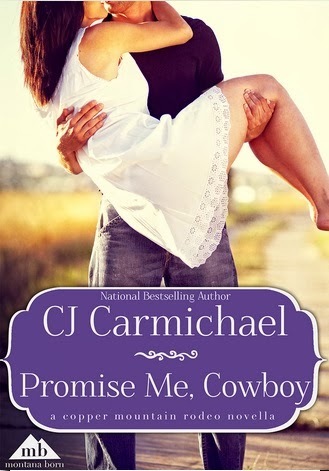 Promise Me, Cowboy by C. J. Carmichael is the third title in this endearing novella series and I thoroughly loved it. There was only one problem: I wished it was a full-length novel! I enjoyed every minute of my stay and simply wanted more of Sage, O'Dell and the picturesque Copper Mountain setting. Sage, 29, was deeply hurt by cowboy O'Dell five years earlier when they hooked up during the rodeo circuit. They acted upon their attraction, but Sage ended up hurt and embarrassed by a situation with O'Dell which was completely out of her control. After suffering a knee injury, she quit racing in rodeos and settled down to open a chocolate shop. When O'Dell enters her store, the old feelings she bottled away with her confectioner's sugar and recipes resurfaces. Why is he back in town, apologizing for the past, and complimenting her? Furthermore, why is her pulse climbing when he smiles at her? Forgiveness, secrets, the power of love and the importance of family all play important roles in this contemporary series. Sage is a wonderful character, strong-willed, honest, and O'Dell is a handsome and nice guy trying to right the sins of his past and the people he wronged by his actions. I couldn't help but like these two. Again, the setting is what really grabbed me and made me appreciate the rich and varied way of life the characters have in the Copper mountains. The families, the histories, and the love stories which continue to come from this gem of a series have solidified my affection all of the books and the authors who write them. I received a complimentary copy in return for my honest review during a blog tour.